All kinds of goodies on this sheet: clothes to fit one of the paper dolls in the Mini Paper Dolls Shape Set, a background of the interior of a fabric store, signs that fit the width of the Altoids Tin Facades (or could hang from the Swirly Border Set or sit between the 2 wrought iron/filigree pieces in the Mini Paper Dolls Shape Set). To make it easier to cut out (and use) at such a small size, the costumes are duplicated on a repeat of the color body (so you can just cut out one full, clothed body per design). Beside signs for a dress shop, there are also french signs for a pastry shop & a sweet shop. 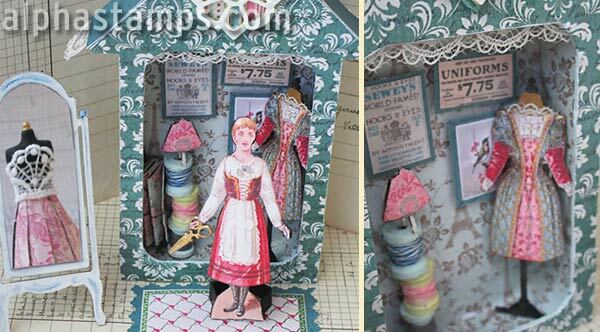 This sheet is also included in the Tiny Dress Shop Kit; see all the other kit components available to buy separately.